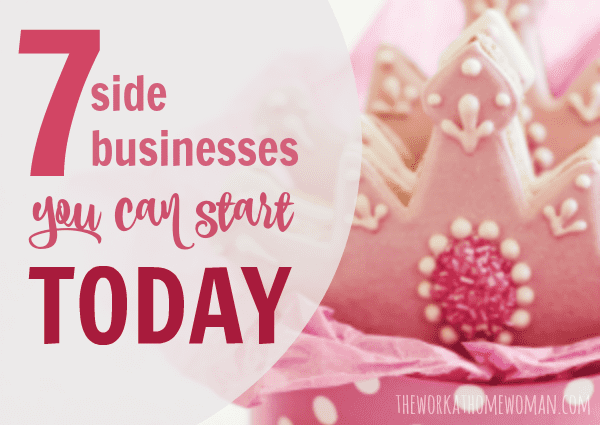 Finding a side business to start while you're working full time or focused on another project is challenging, but it doesn't have to be. There are many good options out there, so we're sharing a few with you below … maybe even some you hadn't thought of yet. Moms are busy, and although we usually have the best intentions to plan out a lavish birthday party for our kids, the reality is, things rarely go according to plan. To have someone step in and take over so we could enjoy our child's birthday instead of stress out about it would be amazing! Consider this: For the cost of a few business cards and flyers, you could be that person. 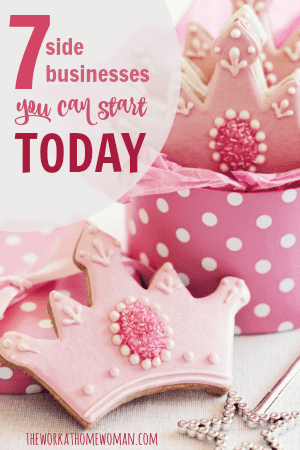 If you know how to throw a party and don't mind doing the leg work required for making contacts, getting everything ready and together and setting it all up, this could be the perfect side business for you. You can work around your schedule and only take the gigs you want, and you get to be creative and use your imagination. In fact, thinking like a kid actually, helps when you're working as a birthday party planner. If animals are your thing and you know a little bit about grooming and caretaking, consider this option. Having someone come to your home to take care of a pet is not only convenient, but your pet will feel more comfortable and relaxed in their own environment. This is a huge advantage in this business as people's pets are like a part of the family and we all want what is best for them. It's a good side business option because appointments can easily be scheduled in the evening and on weekends. If you're comfortable around horses, you might consider offering your services as a caretaker. You can do things that range from brushing and shoeing the horse to feeding and cleaning their stalls. One of the perks might be that you get to ride the horses you take care of, which is payment enough for a true horse lover. But don't worry, you can set your own price as well. This works great as a side business because people usually do these tasks early in the morning and in the evenings, thus allowing you to do it around a work schedule if need be. People who have school-aged children might not necessarily need daycare, but they might need someone to transport their child to and from school (or the babysitters) on a daily basis while they work. Doing this daily at one or more schools with two or more children can add up to a little chunk of change. And it's the same schedule every day (usually), so there are no surprises, and you'll be able to plan out your days accordingly. You can come right to your customer, do the measuring, see what they need done and pick up the garments, then deliver them back to your customer when the alterations are completed. It's on your time, this can easily be done on weekends and offers an accommodating service to those who can't spend a lot of time or money going to a professional tailor. Who would want someone to cook your dinner even just a couple times a week? (ME … said every mom out there!) Find a few households who would like a break from meal preparation on a regular basis. You can charge per meal, and you might think about making things that will go further – like spaghetti, stew, and crock-pot meals. This type of business can totally be done as a side gig just as long as you keep your clientele small. Prepare meals in the evenings or on weekends, and you can freeze them until delivery time. To see what it's like working as a Personal Chef, check out Christy's story. Again, the name of the game here is finding clients who need what you offer, but they are out there. Think of a single guy who has no idea what to get his family members for Christmas, or middle aged man who needs help coming up with the perfect gift for his wife's birthday. Another option would be helping a mom with several small children by doing a once a week shopping for her, so she doesn't have to take all the kids out to two or three different stores. You can charge by the hour or by the job, and mileage can or doesn't have to be included (but be sure to keep track for tax purposes). Check out this post for more info on starting a Personal Concierge business. Have you tried creating a side business yourself, and if so, what was the outcome? Kimi Clark is a career stay at home mom turned writer and blogger for hire with a passion for business. She specializes in posts about writing, blogging, and entrepreneurship, as well as all things parenting and motherhood. Owner & Founder of The Mom Shopping Network, you’ll find her there writing, hosting giveaways, and supporting moms in both their business and motherhood journey. She’s also a devoted wife and mother of four who loves the beach and her early morning coffee. These are great ideas Kimi, thanks for sharing. I can see myself as a personal shopper. I have a lot of experience with that :). I hope you’re having a great week ladies! Glad you enjoyed Kimi’s post. Have a great weekend, Cori.